”Bunny Dance” – Residents of Bunnytown and the Bunny Band use silhouetted dance moves to teach viewers how to dance. It’s That Time Again Game – Multiple-choice game featuring segments with King Fluffy the Forth and Jester Bunny. Exclusive sneak peek of all-new movie Disney Mickey Mouse Clubhouse Mickey’s Adventure in Wonderland. 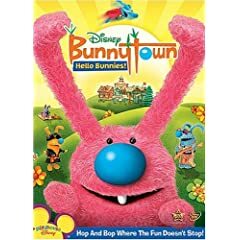 Win a Bunnytown: Hello Bunnies! below. Last date for entries is April 1, 2009.